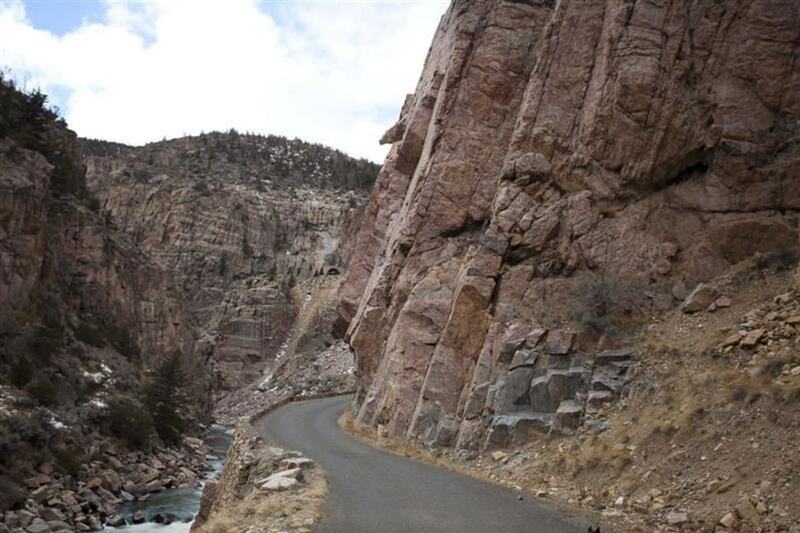 Lower Granite is a patch of rock that sits between the road to Yellowstone and the Shoshone River. 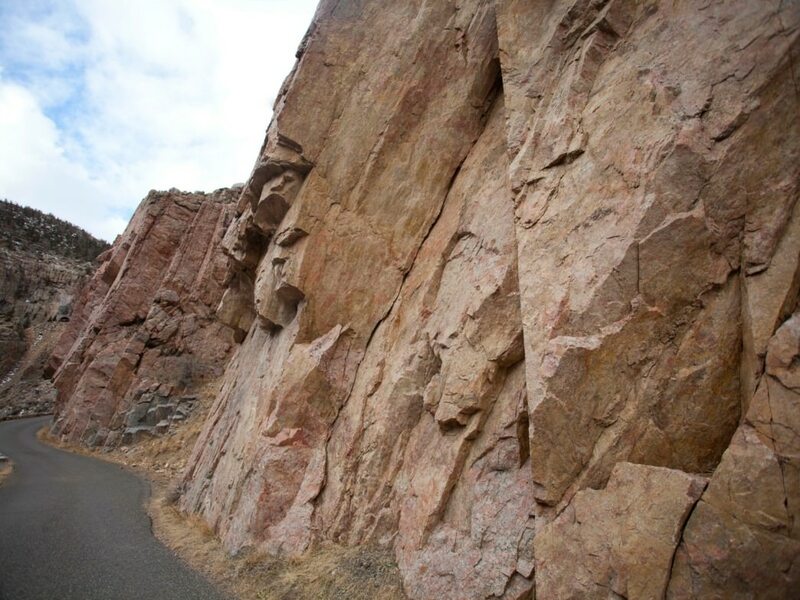 It’s a band of granite that stretches from near the power plant upstream towards the base of the Buffalo Bill Dam. This area is seeing a lot of development and new routes are being put up frequently. Several sections contain a variety of routes within a closely confined area, while others only have one route so far. There’s a mix of trad climbing and bolted routes. Climbing in Cody has generally been centered at the Island, practically right above Lower Granite on the south side of Rattlesnake Mountain. A band of nicely featured rock, Lower Granite is where new development is happening. So new in fact that one route was put up January 2015. It’s got easy access, and is a good three season area. There’s not much sun and the winds howl down the canyon especially in winter. You can get to Lower Granite by a leisurely stroll up the Hayden Arch Bridge Road, or drop down into it from above. Park at the large paved pull out on the south side of the road right before the first small tunnel as you’re driving from Cody. Hop over the guardrail and slip down the slope, or if you’re more adventurous, cross the highway and find the drain flume. It’s about 5’ wide with a gentle downhill trend. It’s tight so probably not the best for a claustrophobic climber. When you get onto the road below, you can access whichever wall you want. There are lots of routes to the north along the roadway, and even some south across the river. To get to the routes on the south side Shoshone, you’ll have to walk almost to the dam where the rocks are close enough to hop across. Definitely don’t try this in winter when the rocks are icy and also not before peak runoff is over. On a high snow year there can be excessive releases from the dam until July, making any attempt at crossing the river foolhardy. Lower Granite contains a handful of easier 5.9/10 and enough 5.12/13 to satisfy any climber. You can belay right on the road and the ambiance doesn't get much better than listening to the roar of the river and watching the play of the light through the canyon. If you’re itching to set some new routes, this is your area. Stop in at Sunlight Sports for the latest intel on the area. Lower Granite is good for families with older kids that you don’t have to worry about falling into the river. Know that there can be traffic on the road from employees of the power plant and the dam. From Cody, take US HWY 14/16/20 west about 4 miles. Locate the large pull off to the left where the historical marker is. Park here and follow the directions above to get to the climbing area. You can also park at the Hayden Arch Bridge and walk up the road about two miles. There are no fees and no facilities. Leashed pets are welcome, but they might get bored since there’s not a huge area to explore due to the proximity of the river.